What it sounds like when 9-year-old boys win their first Knothole game. After two months of trying. 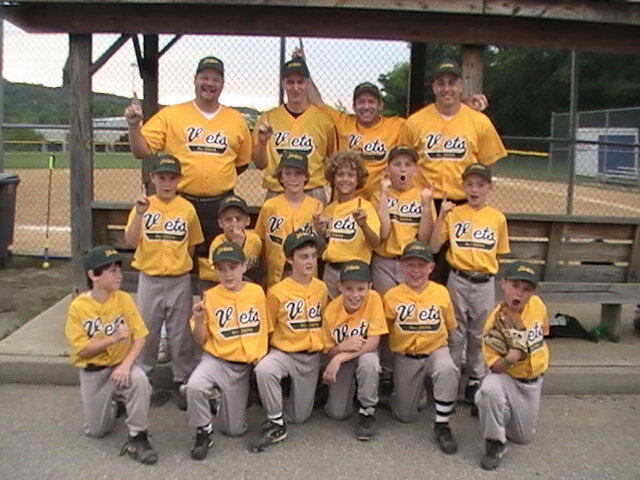 Win #1 for the Bellevue Vets Sliders - 6.8.10 - somewhere in Wilder, Ky.
First row: Matthew Kelly, Tyler Phillipps, Isaac Henry, William Pikar, Gabriel Powell, Warren Naberhaus. Second row: Kenny Ross, Elijah Summe, Jackson Lehrter, Caymen Summe, Harrison Corp, Grant Hemmer. Third row: Coach Dan Pikar, Coach Aaron Corp, Manager Shaun Powell, Coach Jerrod Phillipps. Tonight, the Sliders open tourney play on their home turf. Onion chips preferred. Chicken rings optional.